1 Dissolve the yeast in the lukewarm milk. Sieve the flour into a bowl, stir in the yeast mixture, together with the sugar, egg, egg yolk, salt, rum and the soft butter. Knead to a soft, springy dough. 2 Dust the dough with flour, then place in a bowl and cover. Put in a warm place until the dough has doubled in size. 3 Prepare the crumble topping: Place all ingredients in a bowl and rub together until the mixture resembles breadcrumbs. Cover and place in the fridge to chill. 4 Preheat the oven to 220°C | 425F | gas 7. 5 Knead the dough again and leave to rest again for 10 minutes. Now roll out the dough on a floured surface and place on a baking tray lined with baking paper. Prick all over with a fork. Cover the pastry base with breadcrumbs. 6 Place the rhubarb pieces and the gooseberries in rows on the pastry base. Mix the sugar with the cinnamon and sprinkle over the rhubarb. Let the pastry proof for 15 minutes. 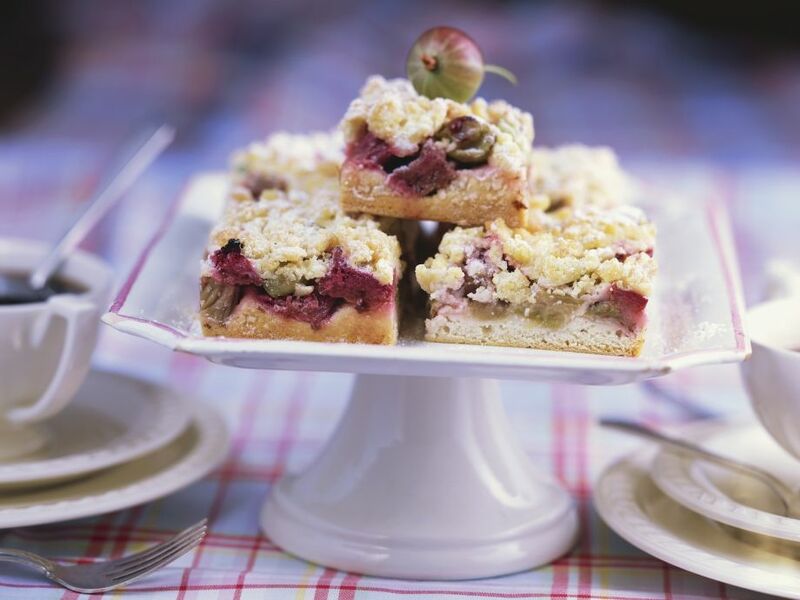 7 Now sprinkle the crumble topping over the rhubarb and gooseberries and bake on the lowest shelf in the oven for about 35-45 minutes. (Cover the cake with aluminium foil if it gets too dark). 8 Remove from the oven and cool. Dust with icing sugar, cut into slices and serve.